Pelican Bomb’s Editorial and Communications Manager Charlie Tatum reflects on his experiences working in the arts and the importance of mentorship. 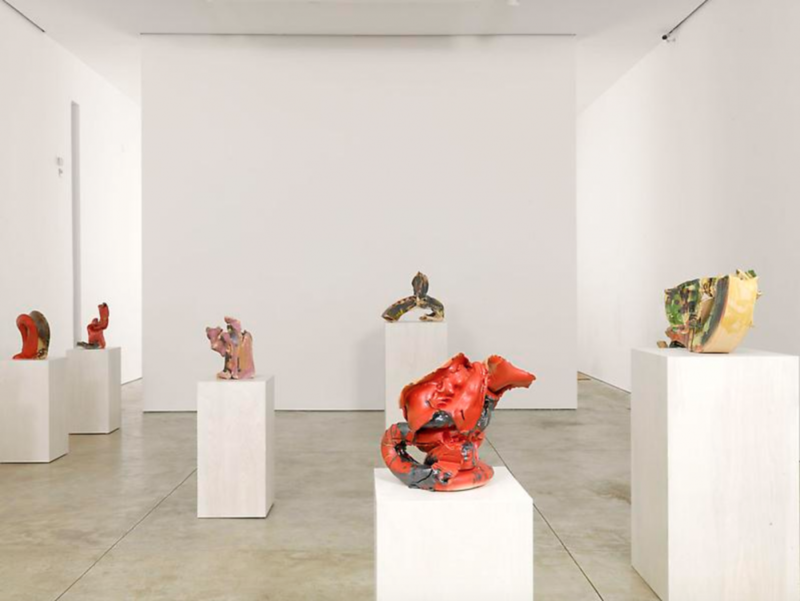 Installation view of “Lynda Benglis” at Cheim & Read, New York. Photo by Brian Buckley. I learned of Pelican Bomb in early 2014. I lived in New York at the time, and I stumbled across Corinna Kirsch’s review of a Lynda Benglis show at Cheim & Read gallery. I was working in a position I hated—in a museum communications department that was a total drag—and I filled my time by reading “press clips,” something that seemed close enough to my job description to avoid being reprimanded. A few years out of college, this was one of the first times I understood the gap between art and administration; the day-to-day chore of working at a museum is only loosely linked to the art itself. I worked in an off-site building and only went to the museum for specific errands or events. With the art 50 blocks away, I remember thinking that I may as well have been sending images and responding to press requests for some corporate entity. At least then I’d have been able to afford my rent in Brooklyn. Pelican Bomb came back to mind a few months later. I had decided to move to New Orleans, and I was trying to wrap my head around contemporary art in the city. I realized reading about art production in New Orleans was the best path to familiarizing myself with the museums, galleries, and alternative spaces I should be visiting. I started writing at this time too, urged by friends in New York who were also trying to make sense of the South we grew up in. We were beginning to collectively understand that the monolithic idea of the American South that had scared us away—too conservative, too locked in the past, too peripheral—was what others had wanted us to think. The perceived superiority of New York and other metropolitan centers is predicated on the provincialization of everywhere else. I felt, even if I couldn’t articulate it then, that I needed to reassess my own experiences growing up in South Carolina within a new framework, one that didn’t discount the South as easily as I had throughout childhood. Writing, literally, was a way to put this ambivalence with my own upbringing into words. Having worked in museums, galleries, and artist studios, I wrote about art during my first months here, and my first piece went live on Pelican Bomb’s site the following March. Writing had never been easy for me, due in part to lack of confidence that I was “right,” that my words actually mattered. Eventually I loosened up and began to think of it as something less definitive, an exercise in looking closely at art to make sense of the world around me. I kept writing, for Pelican Bomb and other outlets, as a way to provide context—art historical, social, pop cultural, and often personal. The process helped me figure out why I liked or didn’t like an artwork. It urged me to find something relatable in art that had originally repelled me and limitations in work I had immediately fallen in love with. And it ultimately did help me orient myself within an expanded vision of the South. Starting in a part-time position managing the events calendar at Pelican Bomb in August 2015, I became the Art Review’s managing editor a few months later, working under my now close friend and mentor Cameron Shaw’s vision for the publication. To a lot of people, I think, the role of editor is pretty opaque. What do editors do? Editors like rules, making sure spelling and punctuation are used consistently across a publication. Editors like breaking rules, too, if the reasoning is sound. Editors are timekeepers, commissioning articles, responding to pitches, enforcing deadlines. Writers are, as a rule, notoriously bad at deadlines. In the context of an article, writers ask the big-picture questions—what does this mean?—and editors often ask ones with smaller scope—do you mean what you say? Editors also survey, look out at the infinite landscape of possible stories—of people, of artworks, of experiences—and discern how a collection of reviews and essays can make up, inform, or broaden a world view. Editors archive, moving narratives and perspectives into the public record. Editors have some degree of power—who gets space, what words get changed—but ultimately editing is about generosity. Uplifting voices, serving as a sounding board, creating a platform for writers’ clearest and brightest ideas to come forward. Editing is generally a thankless job. Most readers don’t think about who edited the pieces they’ve read or how content gets to their screens, but the best editors take their public responsibility seriously. At Pelican Bomb, our Art Review contributors come from an array of different backgrounds. Some are curators, journalists, fiction writers, artists. Some are seasoned art critics; others are fresh out of college looking to get their feet in the door. Very few, if any, write full-time. Part of Pelican Bomb’s mission was to champion all of these voices together and to see “inexperience” not as a hindrance, but as an asset, an opportunity to celebrate and nurture individuality, especially in a city with a historical dearth of professional art critics. Sometimes publishing less experienced writers is more “work,” but it’s ultimately fruitful. The result: A greater diversity of voices is heard and the field is better for it. I graduated from college a few years after the financial crisis. Many people a few years older than me, unable to find employment, had gone to grad school in response to the collapse. And by 2011, they were applying for the same entry-level jobs at galleries, museums, and nonprofits that I was. I remember at that time angrily reading Hans-Ulrich Obrist’s A Brief History of Curating, a collection of interviews with some of the figures who had transformed curating from a niche academic field to a set of art-world superstars. They recounted their starts in a very different economic moment, when it was possible to walk into a museum and land a full-time job with little more than a kooky idea. These curators were afforded the opportunity to take their ideas, watch them flail, rework them, and make them better. I worked at a bookstore for ten dollars an hour and applied for assistant-level positions, hoping somehow that employers would overlook their requirement of “three to five years experience.” At that moment, to me, it seemed like the only people allowed the space to learn and grow were those with trust funds. In recent years, the job market within the art world has become even more saturated. There’s less room for the experimentation we as an industry supposedly hold so dear. There are fewer opportunities for experiential learning. The people getting hired are those with connections (this is nothing new, of course) and those who can afford to take unpaid internships for years. The field gets duller, more homogenous. Recent diversity initiatives in museums are a step, but these often take the form of short-term fellowships, not long-lasting structural change. This isn’t to say we all should throw our CVs out the door, but we should find new ways to think about labor in arts organizations. As a field, we’re chronically overworked and underpaid, but we need to remember that, at some level, sharing—artwork, ideas, resources—is why we’re here. Mentorship is a straightforward way of reminding ourselves of this. In my experience, this happens most often in small nonprofits, where by necessity, everyone has their hand in every pot. At Pelican Bomb, my duties at any given time could stretch from editing, updating the events calendar, and posting on social media to curating, grant-writing, and serving as a public face of the organization. Some tasks I was well-versed in, others were unfamiliar to me. It’s rare to leave a job and feel happy—not just relief, but a sense of accomplishment and growth. In thinking of my last three years at Pelican Bomb, I’ve become a better editor, a better writer, a better curator, and, in my mind, a better person. That wouldn’t have been possible with a job description resistant to change and evolution. We need more chances to learn and to teach each other, to try new things, to celebrate our strengths and recognize our weaknesses. We should be working not only for our supervisors but also with them, so that when we inevitably do the work on our own, we do it even better. Doing and learning and doing again is how we bring, in this case, the art closer—how we remind ourselves that our daily tasks don’t have to be far from the ideals we believe in.